Pte Eric Swansson - Brighton technical school, Victoria, Australia. “The Age” (Melbourne). Tuesday, 8 July, 1941. Page 6. Pte. E. Swansson, 23 (wounded in action), is the only son of Mr. and Mrs. Swansson, Charles-street, St. Kilda. Born in Kerang, he was educated at Brighton-road State School and Brighton Technical School, and was a leading Rugby player for St. Kilda. His father is an Anzac who fought in the World War. Next of Kin – SWANSSON CARL. “Advertiser” (Adelaide, S.A.). Wednesday 17 April, 1946. Page 16. 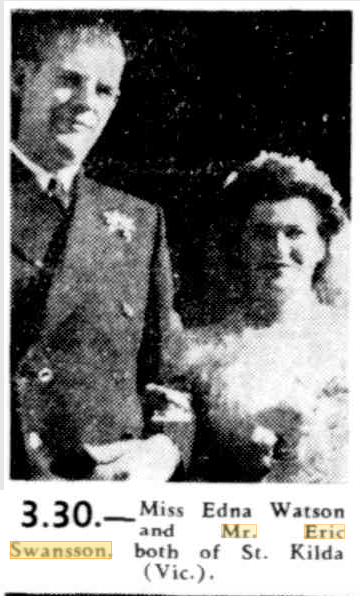 The marriage of Edna, daughter of Mrs. and the late Mr. W. Watson of Kangaroo Island to Eric (ex-A.I.F), son of Mr. and Mrs. C. Swansson of St. Kilda, Victoria, will be solemnized at Pirie Street, Methodist Church on Saturday, April 20 April, at 3.30 p.m.
Miss Edna Watson and Mr. Eric Swansson, both of St. Kilda, (Vic.). “Mail” (Adelaide, S.A.). Saturday, 20 April, 1946. Page 3.